I left Bordeaux early last week along with photographer Martin Crook for our big tour of the Midi. I had a few things to do in the Minervois before we could actually kick start the trip. It was already hot in Bordeaux and as we headed down to Toulouse … the outside temperature was steadily rising and the inside air conditioning was slowly lowering! We made good time and managed to stop off for lunch in a lovely little village called Trebes. Trebes is right on the Canal de Midi and a popular stop off for narrow boat owners. 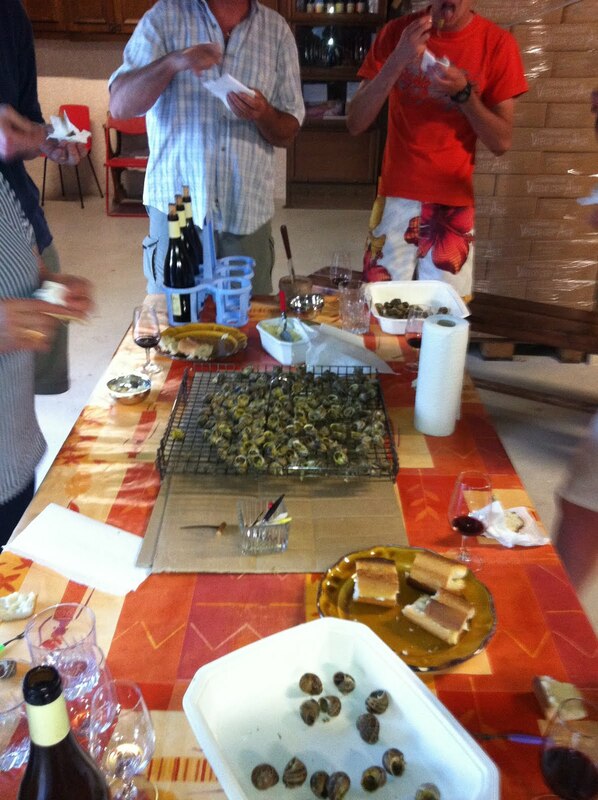 After a little bit of tapas we carried on into the Minervois to meet Andrée Ferrandiz to taste some wines. Cave Rieux is the great little co-op where I source the Madame F with Andrée and the new Chai Syrah, the ‘SY’ … drinking well right now and lovely when chilled. The Minervois has such delicate, spicy and floral Syrah and the mix of wild herbs that hangs in the air shows wonderfully in the wines. 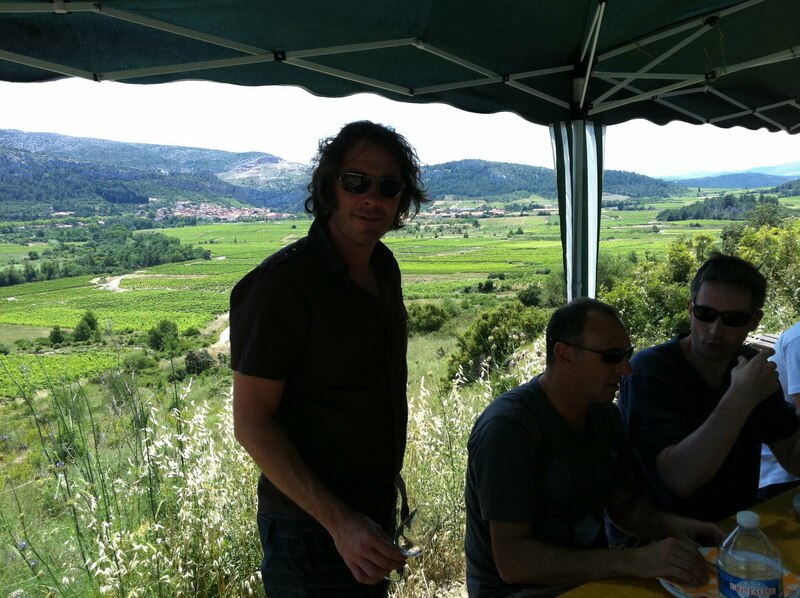 We met up with Cat, our new Midi buyer, head of wine Justin and Tony in my second home ‘Le Roussillon’. 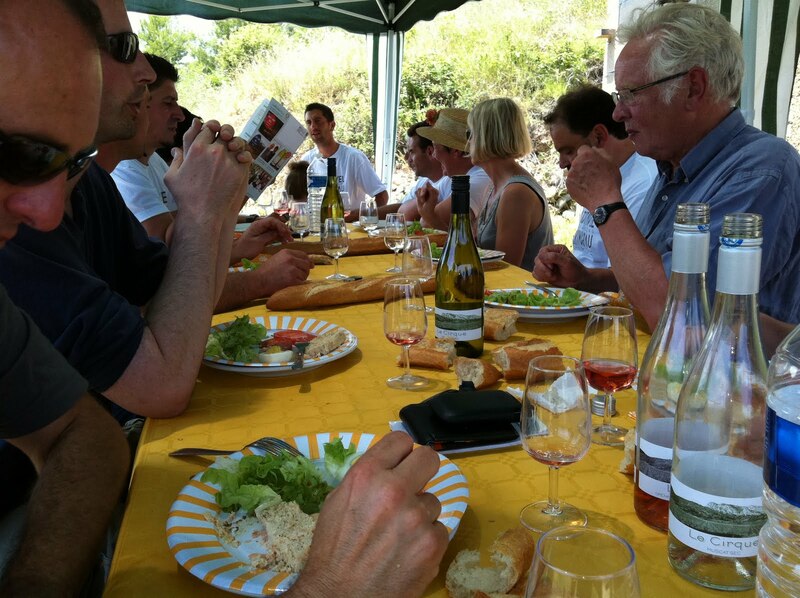 Our first stop was Tautavel for a BBQ put on by the local vignerons of the village. The setting was spectacular, up high in the wild Roussillon garrigue overlooking the valley de Verdouble. The oldest remains of man found on French soil were found here … dating back 45,000 years! The Roussillon style lunch started (as is the norm here) with lots of banter, smoking grillade and some lovely wines from the area with food pouring out of the little ‘casot’ (vineyard hut). After quite a long time, the old Rivesaltes Ambre Hors d’Age sealed the end of the meal. Poor Cat had been trying all day to meet us and after trains planes and automobiles she finally arrived in a very hot Perpignan at the new station ‘El Centro du Mundo’ as named by artist Salvador Dali. Next stop was my adopted home village of Maury to meet Jean Charles and Celine Duran, owners of the Vent de Folie vineyards. JC is quite a character, always smiling and joking even though it’s tough times being a grape grower here in Maury. The yields are ridiculously low and everything is done by hand on crazily planted steep vineyards. But the people are just like the black slate soil: hard as rock … and they never, ever give up! After 10 years of working together we now use all 10 hectares of JC’s vineyards to make Vent de Folie. The visit started at his tiny cellar under his house and when I say tiny, I mean tiny: only two people can fit inside at any one time! It’s a basic winery but does the job: some fibre glass vats, two hoses a pump and bucket! The 2010 wine is now ageing in barrel at the Chai in Bordeaux. JC did age some wine years ago but barrels were everyway … even had them in his hallway, so he and especially Celine are very pleased to age the wine at our cellars! We then went to visit ‘JC’s’ old vines before dinner at his dad’s place in Maury. Pappy Pierro, as he’s known in the village, is the master of the ‘cargolade’ (snail bbq)! 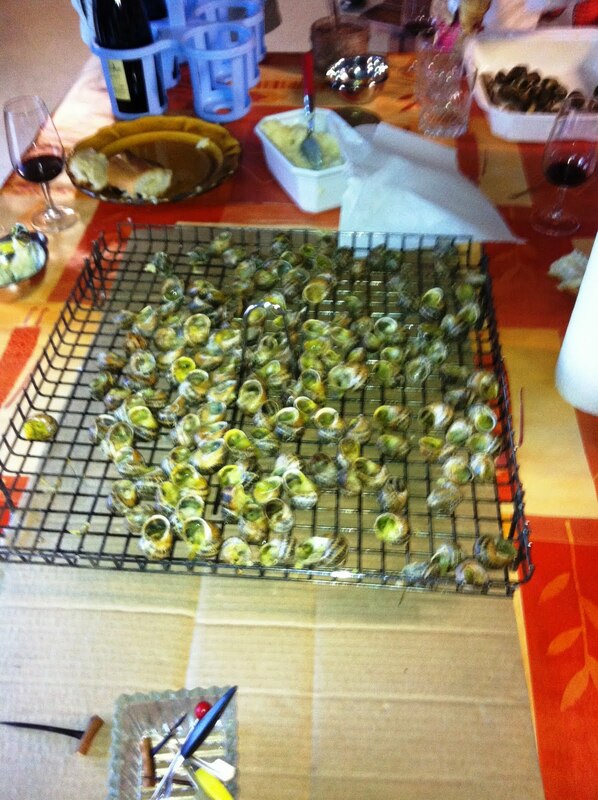 Pappy catches snails and raises them on the local wild herbs (fennel, rosemary and thyme) which flavour and purify them. Then a dot of lard is added and simply grilled on the open fire. Great with a drop of aioli and a slurp of Vent de Folie! We ate down in Pappy’s garage amongst all the tools. There were a few intriguing palates of wine down there too … JC’s wine from before the Vent Folie days. He popped a couple of bottles … delightful stuff 2004, 2005 and 2006, what a find!